We could choose from many great jazz orchestras during the big band days, and most of them featured vocalists who became as famous as the groups with whom they worked. Remember the days when you could catch them at ballrooms, theater stage shows and jazz clubs, and in movies? Sadly, as time passed, the costs associated with large orchestras (and famous singers) became prohibitive; dancing became less popular; and jazz-related entertainment was packaged in smaller doses at smaller venues. Concert halls and festivals replaced ballrooms, and road tours disappeared almost completely; albums and DVDs took their place. That said, musicians occasionally have formed “special” groups to deliver and record a few concerts. Once in awhile, such units would become popular enough to carry on for years. The Clayton/Hamilton Jazz Orchestra (CHJO) is one such organization. It came to life in 1985, thanks to drummer Jeff Hamilton and brothers John (bass) and Jeff Clayton (sax). Their interpretation of “big” was truly big: five trumpets/flugelhorns, four trombones, five saxes and woodwinds, and a rhythm section of piano, bass, guitar and drums. The individual members have varied over time, but Hamilton and the Claytons have remained a constant. Let it be said: The CHJO is the best big band orchestra in existence today. 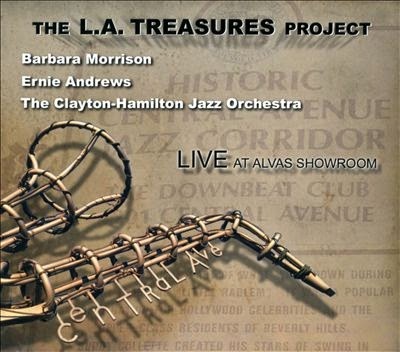 This particular release is made special by the inclusion of two vocalists: Ernie Andrews and Barbara Morrison. Andrews was born in 1927, Morrison in 1950; both are jazz icons. Almost all of this album’s tunes feature vocals by these two artists, and their treatment is wonderfully bluesy. It brings back memories of decades past. Hamilton, simply put, is the best drummer working, for organizations of any size. Back in the day, the drummer always was key in the swingingest bands. And I’m not thinking only of his ability to solo; Hamilton drives his wonderful band, and hits every emphasis. He’s a master. This album reminds me of the time when the patrons wouldn’t dance; they’d gather around the stage and just listen to the band. The CHJO is that kind of orchestra.